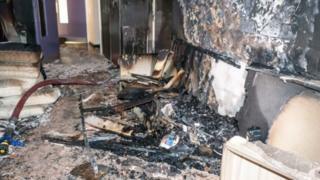 A tower block fire began after a sofa left in a communal area was set on fire. The fire started on the 22nd floor of the 32-storey Cleveland Tower, Holloway Head in Birmingham. It is understood 750 people live in the tower although no one was injured. Smoke has affected the building from the 15th floor to the top of the building. Police are treating Saturday's fire as arson with intent to endanger life. 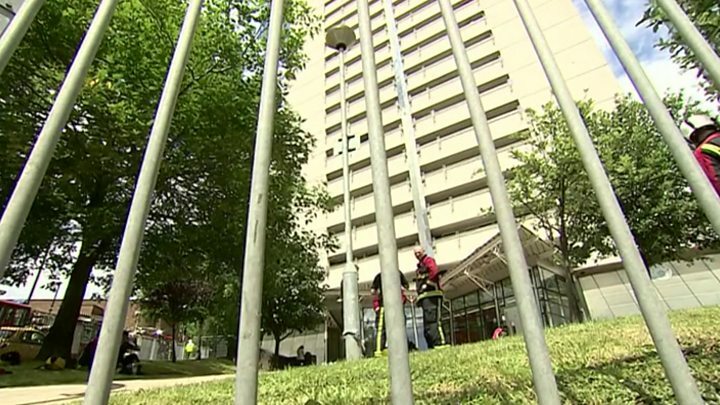 Area Commander Ben Brook, of West Midlands Fire Service, said following last month's fire at Grenfell Tower in London the Cleveland Tower incident was shocking for everyone concerned. He said: "It is important that lobbies, stairwells and communal areas are kept free of clutter and combustible materials." Some Cleveland Tower residents said communal areas are often left cluttered. Others said they did not hear any smoke alarms go off, with one man, who said he lived a few floors below the fire, saying he found out about it through social media. A spokesperson from WM Housing, a housing group which looks after the building, said that they operate a "keep communal areas clear policy" and has a concierge that will arrange for anything left in communal areas to be removed immediately. The building has no central fire alarm, it said, or smoke alarms in communal areas apart from where the bins are kept, but smoke alarms are provided in all of their flats. Residents are responsible for changing smoke alarm batteries.